You are curenlty in Halyard Mic-Key Continuous Feeding Extension Set, With Enfit™ Connector, 12" made by Kimberly Clark Professional and asigned to category. Halyard Mic-Key Continuous Feeding Extension Set, With Enfit™ Connector, 12"
For Use With Mic-Key Low-Profile Gastrostomy, Jejunal And Transgastric-Jejunal Feeding Tubes. Enfit™ Feeding Connector Allows A Solid Screw Connection To The Enteral Feeding Sets. The Secur-Lok Connector At The Patient End Fits Perfectly Into The Mic-Key Feeding Port Without Damaging The Anti-Reflux Valve. You have selected Halyard Mic-Key Continuous Feeding Extension Set, With Enfit™ Connector, 12" from Enteral Feeding Supplies. We hope that this Halyard Mic-Key Continuous Feeding Extension Set, With Enfit™ Connector, 12" made by Kimberly Clark Professional is what you were looking for. If you have any questions about this particular Halyard Mic-Key Continuous Feeding Extension Set, With Enfit™ Connector, 12" or any other products from Enteral Feeding Supplies, please call us. We have an experienced staff that will gladly help pick out the correct Halyard Mic-Key Continuous Feeding Extension Set, With Enfit™ Connector, 12" for you, also. 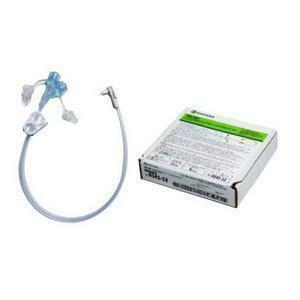 If you are looking to make a purchase of Halyard Mic-Key Continuous Feeding Extension Set, With Enfit™ Connector, 12" in large quantity or you are a Hospital or Medical facility and need help on making a purchase of Halyard Mic-Key Continuous Feeding Extension Set, With Enfit™ Connector, 12" made by Kimberly Clark Professional, please contact us.